Have you ever been treated unfairly? How did it make you feel? Probably not too good. Most people generally agree that a fairer world is a better world, and our AI researchers couldn't agree more. That's why we are harnessing the power of science to create AI systems that are more fair and accurate. Much of the power of AI today comes from the use of data-driven deep learning to train increasingly accurate models by using growing amounts of data. However, the strength of these techniques can also be a weakness. The AI systems learn what they're taught, and if they are not taught with robust and diverse datasets, accuracy and fairness could be at risk. For that reason, IBM, along with AI developers and the research community, need to be thoughtful about what data we use for training. IBM remains committed to developing AI systems to make the world more fair. 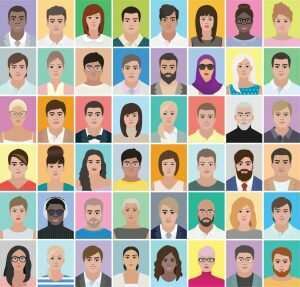 How do we measure and ensure diversity for human faces? On one hand, we are familiar with how faces differ by age, gender, and skin tone, and how different faces can vary across some of these dimensions. Much of the focus on facial recognition technology has been on how well it performs within these attributes. But, as prior studies have shown, these attributes are just a piece of the puzzle and not entirely adequate for characterizing the full diversity of human faces. Dimensions like face symmetry, facial contrast, the pose the face is in, the length or width of the face's attributes (eyes, nose, forehead, etc.) are also important. Today, IBM Research is releasing a new large and diverse dataset called Diversity in Faces (DiF) to advance the study of fairness and accuracy in facial recognition technology. The first of its kind available to the global research community, DiF provides a dataset of annotations of 1 million human facial images. Using publicly available images from the YFCC-100M Creative Commons data set, we annotated the faces using 10 well-established and independent coding schemes from the scientific literature. [1-10] The coding schemes principally include objective measures of human faces, such as craniofacial features, as well as more subjective annotations, such as human-labeled predictions of age and gender. We believe by extracting and releasing these facial coding scheme annotations on a large dataset of 1 million images of faces, we will accelerate the study of diversity and coverage of data for AI facial recognition systems to ensure more fair and accurate AI systems. Today's release is simply the first step. While IBM Research is committed to continuing study and investigation of fairer facial recognition systems, we don't believe we can do it alone. With today's release, we urge others to contribute to the growing body of research and advance this important scientific agenda. To request access to the DiF dataset, visit our webpage. To learn more about DiF, read our paper, "Diversity in Faces." More information: L. G. Farkas, Anthropometry of the Head and Face, Raven Press, 1994. A. Chardon I. Cretois and C. Hourseau, "Skin colour typology and suntanning pathways," International Journal of Cosmetic Science , Aug. 1991, 13(4), pp. 191-208. 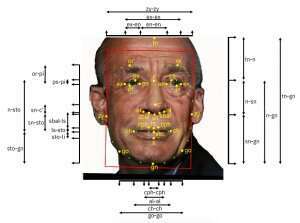 Y. Liu, K. L. Schmidt, J. F. Cohn, S. Mitra, "Facial asymmetry quantification for expression invariant human identification," Computer Vision and Image Understanding, Volume 91, Issues 1–2, July–August 2003, pp. 138-159. L. G. Farkas, et. al, "International anthropometric study of facial morphology in various ethnic groups/races," J Craniofac Surg. 2005 Jul;16(4), pp. 615-46. N. Ramanathan, R. Chellappa, "Modeling Age Progression in Young Faces," Intl. Conf. on Computer Vision and Pattern Recognition (CVPR), 2006, pp. 387-394. A. C. Little, B. C. Jones, L. M. DeBruine, "Facial attractiveness: evolutionary based research," Philos Trans R Soc Lond B Biol Sci. 2011 Jun 12;366(1571), pp. 1638-59. X. Zhu, D. Ramanan, "Face Detection, Pose Estimation, and Landmark Localization in the Wild," Intl. Conf. on Computer Vision and Pattern Recognition (CVPR), 2012, pp. 2879-2886. Z. Liu, P. Luo, X. Wang, X. Tang, "Deep Learning Face Attributes in the Wild", Intl. Conf. on Computer Vision (ICCV), 2015, pp. 3730-3738.